Element is a high-rise apartment complex with retail on the ground floor. 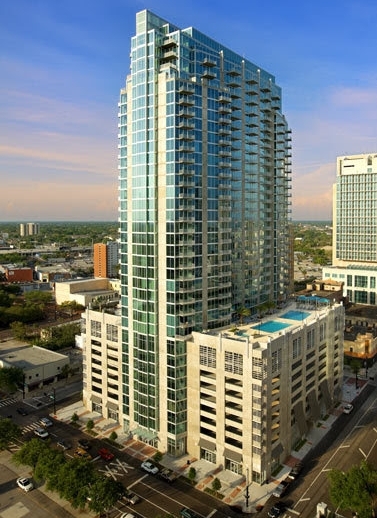 Perfectly positioned on Franklin Street, in the heart of the bustling Tampa Arts District, Element residents are within walking distance of downtown offices, shopping, dining, and entertainment venues. It is the quintessential, authentic Tampa experience few have the privilege of enjoying – indulging in Tampa’s culture while enjoying luxury apartment living with style and convenience. Amenities include Element’s modern poolside clubroom, state of the art fitness center, 24-hour full-service concierge, resort-style rooftop swimming pool, cabanas and an urban backyard, outdoor fireplace.